Is there anything better than a hearty bowl of noodles? 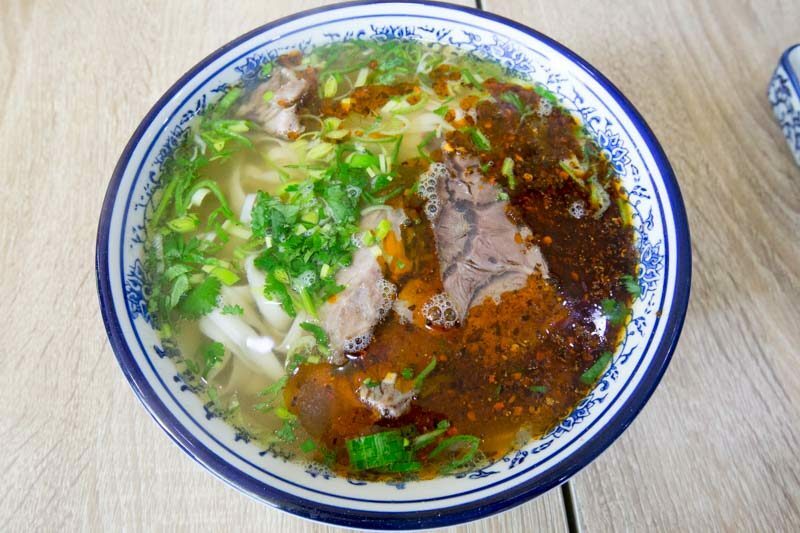 Tongue Tip Lanzhou Beef Noodles (舌尖尖兰州牛肉面) is a popular Lamian chain that arrived on our shores. Never one to say no to beef noodles, I made my way down with gusto. 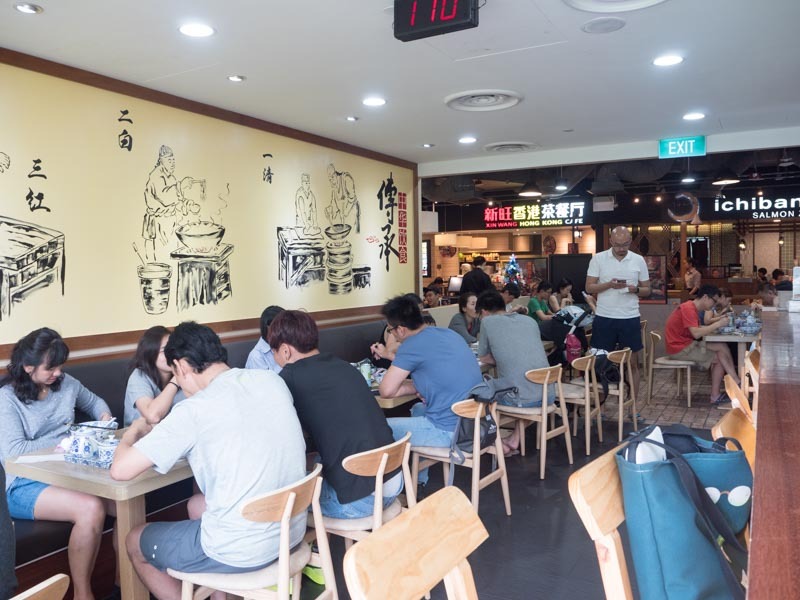 Located in the food court section of Tiong Bahru Plaza, Tongue Tip Lanzhou Beef Noodles looks like your typical run-of-the-mill eatery with hungry lunch-goers tucking into their meal. 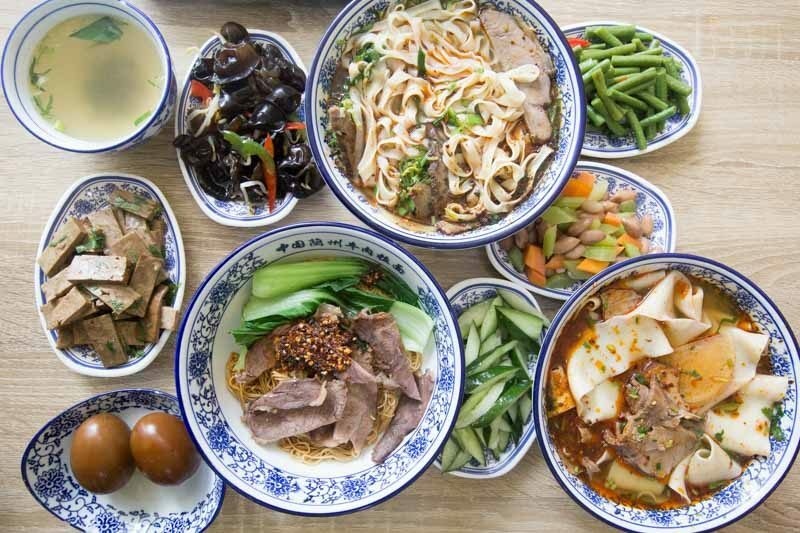 What I didn’t know was that this Lanzhou chain boasts over 300 outlets across China and even comes with several accolades, such as numerous food awards and is an accredited member of the official Lanzhou Lamian Association. 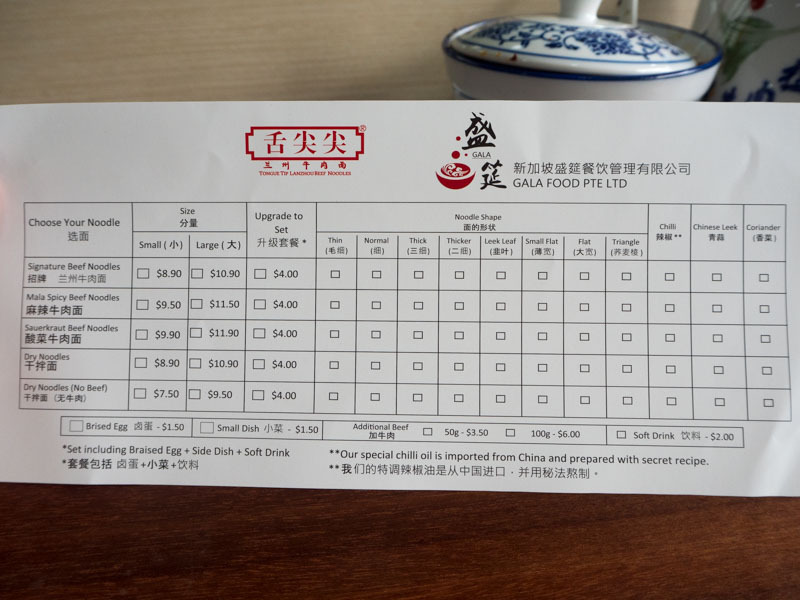 While there have been a few Lanzhou Lamian restaurants already here in Singapore, the reviews have been lacklustre at best. 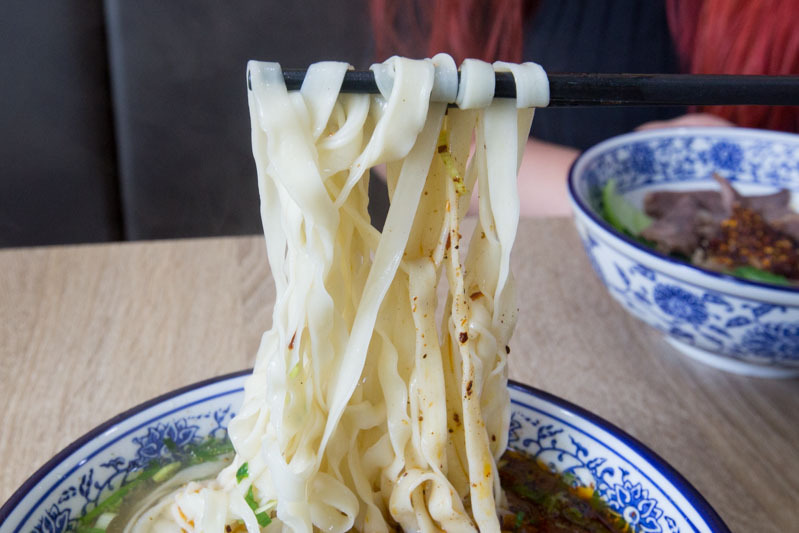 With over eight different types of hand-pulled noodles, will the Tongue Tip Lanzhou Beef Noodles be up to par? Here, you have a number of ways of customising your noodles, from thickness to the shape and a choice of soup or dry noodles. To get a good idea of what the restaurant offers, we ordered three bowls (two soup and one dry version) and all of their side dishes. Another thing I like about Tongue Tip Lanzhou Beef Noodles is that every bowl of noodles is made-to-order. 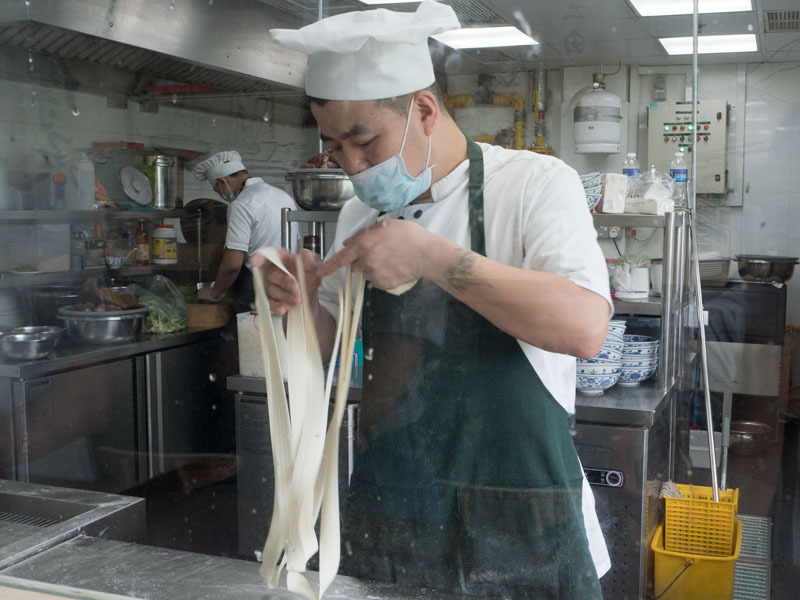 There is an open kitchen where you can watch the noodle masters expertly pull lumps of dough into long elegant strands of noodles. This means that every bowl of noodles is freshly made, and trust me, it makes a huge difference. We began with Signature Beef Noodles (S$8.90 Small, S$10.90 Large) with Flat noodles. 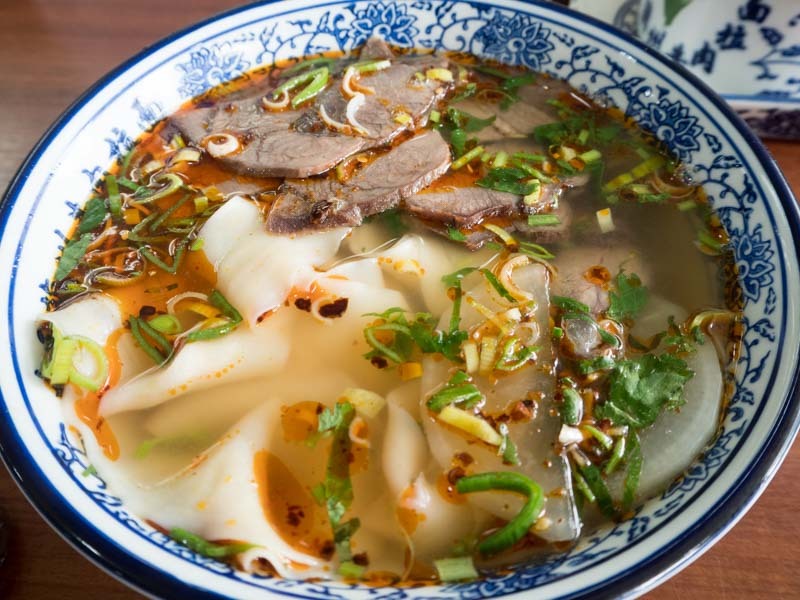 A standard bowl comes with a clear broth which I’m told is made with 15 spices, a couple slices of beef shank and a smattering of chopped scallions and coriander. Being quite the noodle fiend, I wasted no time in trying these hand-pulled noodles. 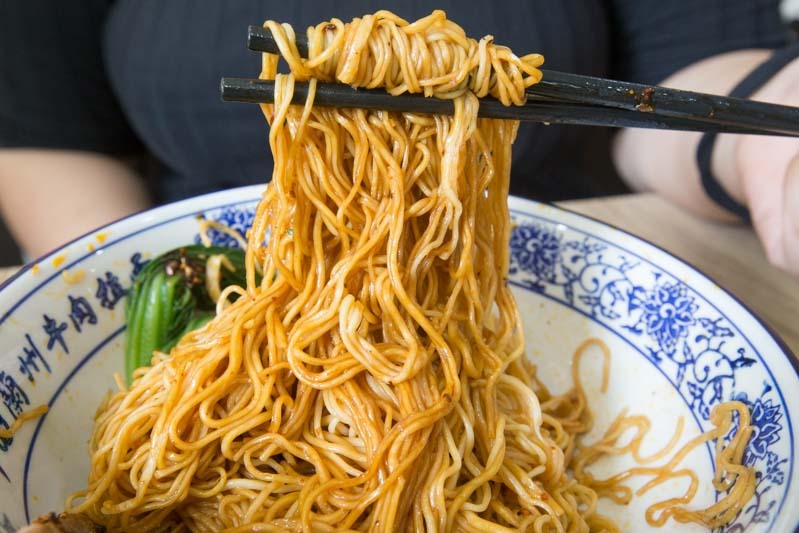 The flat noodles were chewy and firm to the bite and oh-so-satisfying when slurped. The broth that accompanied the noodles was light and comforting and worked as a good base for the other elements in the bowl. 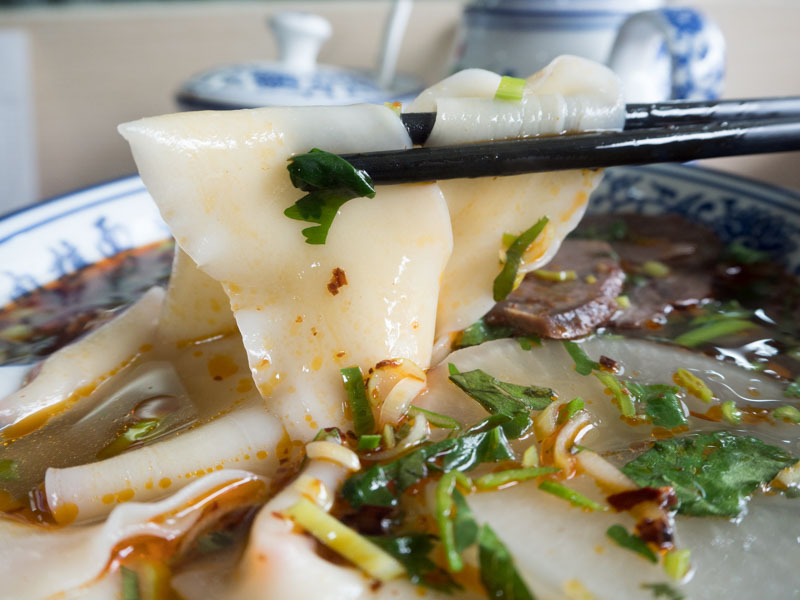 The daikon slices were soft but not mushy, one of the main features in Lanzhou Lamian. Of course, this might be a little ‘boring’ for many of our spice lovers out there. 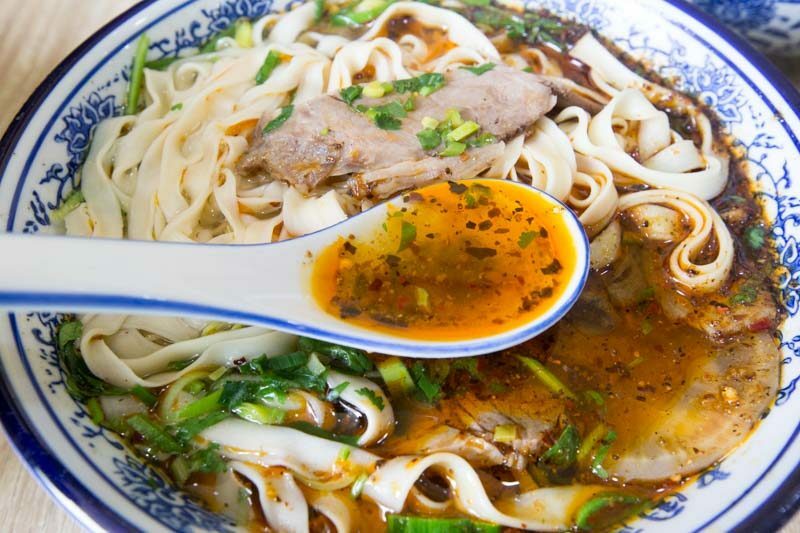 Fret not, Tongue Tip Lanzhou Beef Noodles has specially imported chilli oil from Lanzhou if you need to spice up your bowl. I put a dollop of chilli oil into my bowl hoping for some of that fiery kick. What you get is more of a firm nudge, which I was quite surprised and pleased with. The chilli adds more depth to the broth and made every slurp an even more satisfying one. Now, for what we are all here for, the slices of beef. Beef shank tends to be a little tough and sinewy, given that it’s from the cow’s leg where the muscle is constantly working. Therefore, a lot of work is needed to break down this cut. You get quite a few slices of beef shank and they were tender and well seasoned. The meaty flavour complemented the lightness of the noodles and broth. Another hot favourite is the Mala Spicy Beef Noodles (S$9.50 Small, S$11.50 Big), we had this with noodles of Normal thickness. The noodles being significantly thinner than those in the previous bowl turned soggy faster. I suggest wasting no time when digging into this bowl. 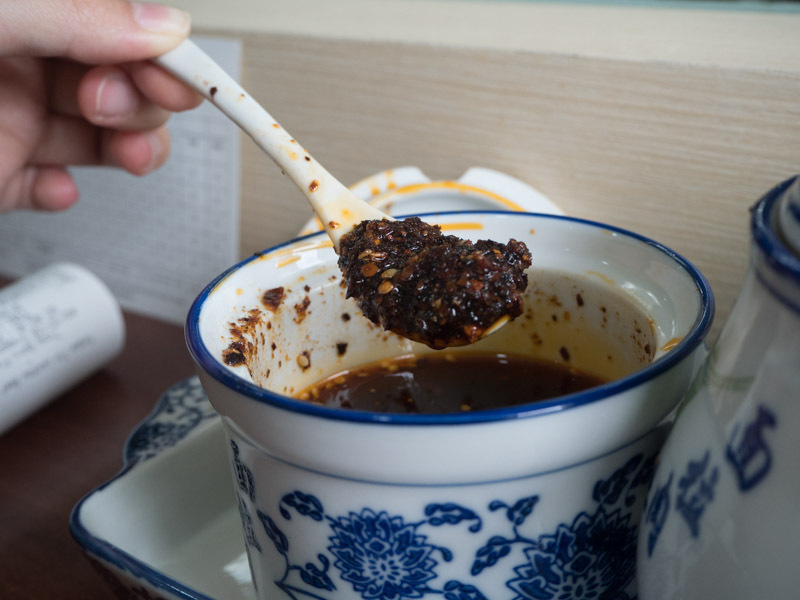 The broth comes with that trademark layer of oil and with each spoonful, there were hints of mala spices we are so familiar with. I would have to say that the mala flavour was more of a calefare rather than the main character. Don’t get me wrong, I appreciated this quality of the broth. I wasn’t perspiring or crying out for a glass of water; a much milder alternative for those who enjoy mala but don’t want to be a hot mess after. The last bowl we had was the Dry Noodles (S$8.90 Small, S$10.90 Big). Instead of the daikon pieces, you get a serving of blanched vegetables and mound of the Lanzhou chilli sitting atop a bed hand-pulled noodles. The noodles were silky and had the consistency of wonton noodles. The satiny noodles were well-coated with the chilli oil and the crunchy vegetables provided good texture in every mouthful. The chilli here is more pronounced, with the spices being more discernible and prominent. Needless to say, this hearty bowl was polished off within minutes. 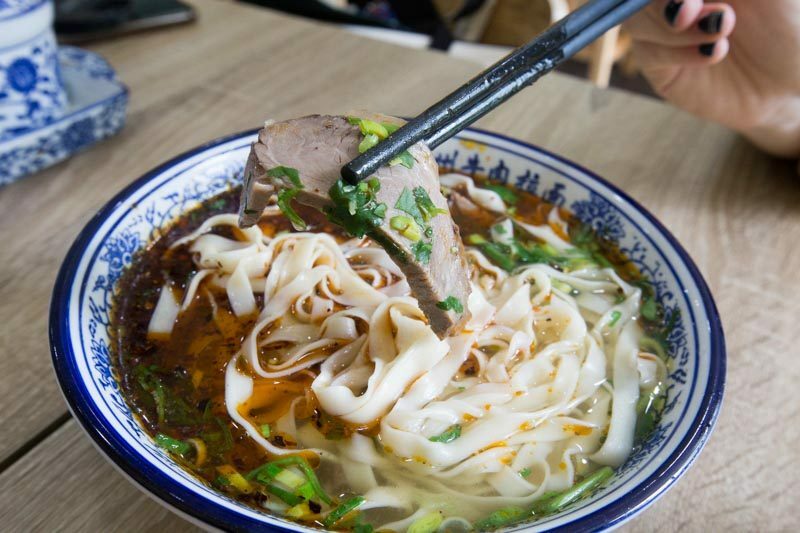 Historically, Lanzhou Lamian is made by the Hui who were Chinese-Muslim and used halal meat. 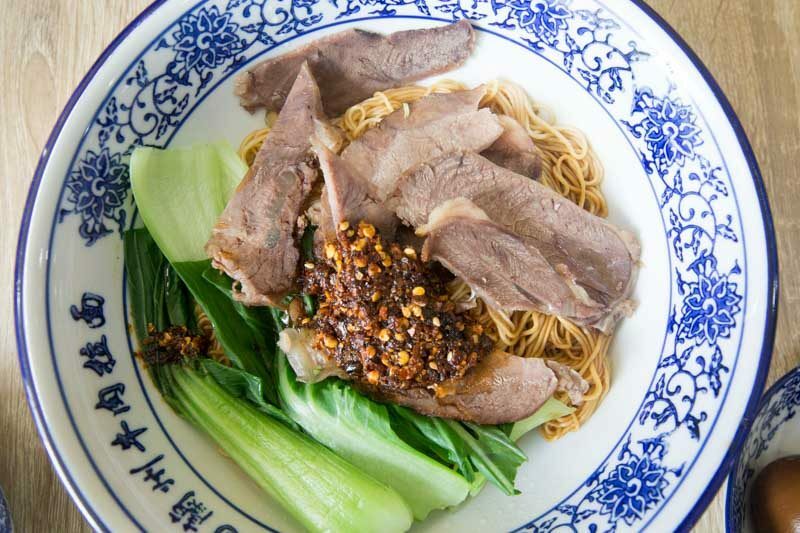 While Tongue Tip Lanzhou Beef Noodles follows in that tradition, only the Tiong Bahru Outlet is Halal-certified. Their Chinatown outlet is still awaiting confirmation. I tend to be sceptical of big chains as while they are popular, the food tends to be substandard. However, Tongue Tip Lanzhou Beef Noodles did not disappoint. 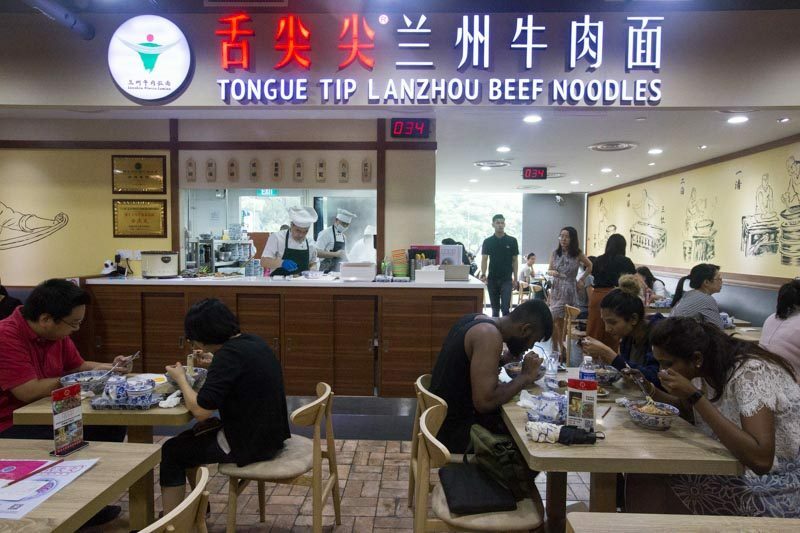 The fact that Tongue Tip Lanzhou Beef Noodles is found in heartland malls, such as Tiong Bahru Plaza and Chinatown Point also speaks to its accessibility and exposure. 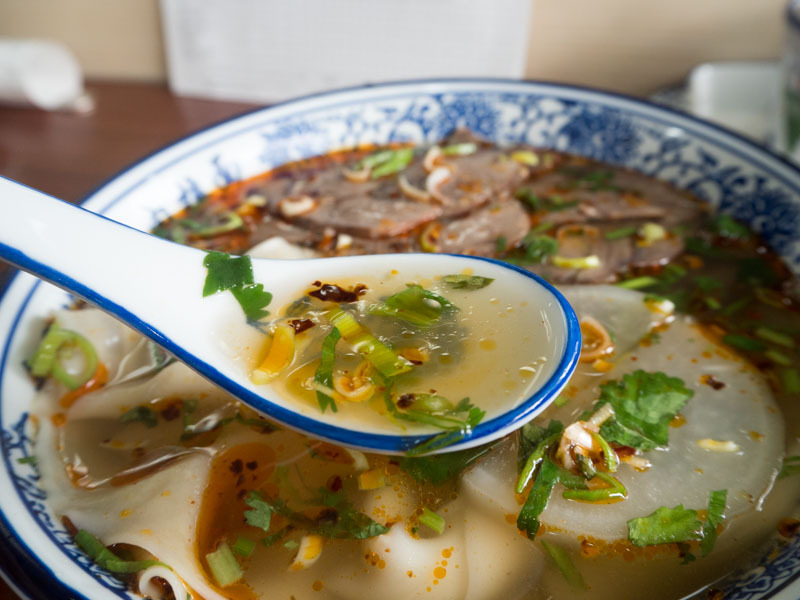 With the growing interest in China cuisine, I foresee this place quickly rising to the top of everyone’s list for Lanzhou Lamian.